It can be hard to keep track of all the various financial tasks you need to do during a given year. Today I thought I would share a simple list so you can map it out on whatever calendar application you like to use. Here are some of the key financial tasks that should be done at least once per year. Setting your investments on an automatic contribution schedule is awesome. Ignoring your portfolio until retirement is dumb. At least once a year you should be taking a look at your portfolio and rebalancing your asset allocation. That sounds like a complicated concept, but really all it means is to make sure you have the right percentage of money in each investment category according to your financial plan. For example, if you want 70% of your money in US stocks and 30% in a total bond market mutual fund, checking your allocation will show how far off you are. If you find yourself at 75% stocks and 25% bonds you would then rebalance your portfolio by selling off some of the stock mutual funds (5% of your total portfolio) and reinvesting that money into the bond investment. Why is rebalancing so important? It’s really simple: it forces you to sell high and buy low. It is easy to “let things ride” when stocks have had a great run, but regularly selling the areas of your portfolio that have grown and buying the areas that have shrunk will save you a lot of headache in the future. Another perk of rebalancing your portfolio on an annual basis is you can get a tax break. Harvesting your tax losses is where you sell an investment that is worth less than what you paid for it. You can use the resulting difference to either offset capital gains from investments that you sold that made a profit for you or use up to $3,000 of the loss to offset your income tax owed to the government (you can roll any extra loss above $3,000 to the following years until it is used up). Another benefit to harvesting tax losses: you don’t have to completely leave your investment forever. Let’s say you invested $10,000 in an S&P 500 index fund right at the market’s peak in October 2007. You could sell the investment when the market bottomed out in March 2009, lose more than 50% of your investment, be able to take that loss against your income that tax year, and re-purchase the shares 31 days later (there are very specific rules the IRS has in place to where you can’t repurchase the same or very similar share for a month after you sell). My very first article in the series included the tip of finding cheaper insurance rates. Just because you got lower rates this year doesn’t mean that rate will be the lowest next year. Regularly shopping around for 15 minutes can result in significant saving of money over the coming years. Put this on your calendar. When you are shopping around your insurance coverages, consider doing the same for your banking products. Think you’re getting the best interest rate? Check around. Think you’ve got the best rewards on your credit card? A competing firm may have just launched an even better deal. In addition to the 4 key activities above, here are several additional things you can do to further optimize your finances. Set financial goals — Think about what you have done and what you want to accomplish. Are you moving closer toward your goals? Set up a plan so that you can get where you want to be. Re-evaluate your budget and make adjustments — Reviewing your budget (if you have one) should be a regular activity. However, you should look at the full year budget to take into account irregular expenses so that you can plan ahead for the next year and trim unnecessary expenses that might now show up on your monthly reviews. Review your home services — Your home uses many services, such as, television, internet, telephone, cell phone, home security, etc. Negotiate for a lower rate or change to a different provider. If you own a business, do the same of your business as well. Increase your contribution to retirement plans and savings — If you have extra money because you just got a raise, or improved your cash flow, you should increase your contribution percentage. Take a minimum distribution from your Traditional IRA — If you’re 70.5 years or older, be sure to follow the required minimum distribution rule and withdraw money from your IRA. Pay down your tax-deductible bills — There are many tax deductible expenses, such as property tax bills, January mortgage bill, business expenses, etc. If you are in the position to do so, paying them down this calendar year will result in immediate tax savings come tax filing time. Adjust your tax withholding — If you get a big refund check, that is an interest free loan to the government. You are better off lowering your withholding and get a little more money in each paycheck. Visit Your Doctors — If you already exceed your deductible, it is a good idea to get you family’s medical, vision and dental checkups done before the end of the year. This way, you’ll pay less out of pocket expenses. Review your beneficiaries — Listed beneficiaries for your retirement accounts and insurance plans take precedence over your will. So review them carefully so that these funds are distributed as intended. 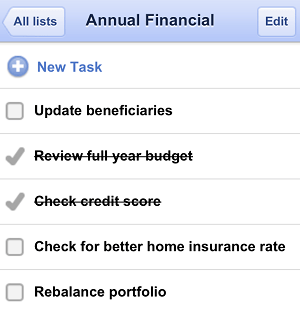 Set up a financial calendar — Remembering to do financial tasks that only occur every 6 to 12 months is difficult. Make sure you set up a calendar plan to remind yourself of these tasks. Set up alert so that you’ll remember what needs to be done. Follow through and take care of the task. Let me know what you think: have I missed any major annual financial events? One financial tasks that I have not paid much attention too in the past was taxes probably because I was just a W2 employer. Now that I am an entrepreneur, I have to pay much closer attention to my taxes and get them handled by a tax professional instead of using something like turbo tax. Great list. I would add quarterly and yearly home repairs. Starting in 2012, I changed my attitude by becoming responsible and not to continue with my habit of “I don’t care”. In January 2012, I started to gather, sort and organize my financial records so that when February 2013 comes, I have all my records ready for preparing my 2012 income tax returns. In June 2012, I created my first website (gohotmoney.com) with a desire to earn money through blogging to pay all my credit card and other debts. I was inspired by Moolanomy’s success and I want to duplicate it in the coming years through my blog. In March 2012, I opened a savings account at Wells Fargo Bank and eventually will invest in certificate of deposits. I picked up some ideas from Moolanomy for my own blog articles. Cheers for your continued success! Setting clear goals is critical and i personally find that this is very very helpful to help me plan ahead and also to review how I have been doing. Great list, but it’s hard to do all those things in a single day. I like the idea of setting up a financial calendar. Thanks for the list. It will come in handy. Great tips! When we decided to spend less than our income and live frugally, we cancelled our cable and landline services. Similarly, I also canceled my subscription to parenting and food magazines. We also downgraded our cellphone to lower plans. It reduced our expenses to 12%. This is a great resource! It’s nice to have it “checklist style” and all in one place. I like that you list setting financial goals as a yearly to-do; it is important to keep re-analyzing where your goals are at. Excellent post, thanks! My parents have always taught me to look after my finances and each year I check my credit score to make sure that its ok as you mention in point 11. A friend of mine had his identity stolen and would not have known this until he checked his credit score and saw that someone else had taken out finance in his name. So if I was to take 1 point from this article it would be to check that every year. I know I do!